Hi there and welcome, in this post we’re going to take a look at the SmartBidet SB-1000 Electric Bidet Seat for Round Toilets with Remote Control. I will give you a complete overview of this bidet toilet seat. I will show you the features and tell you the benefits of why having a bidet over the conventional toilet seat is much better. We will also point you in the right direction to where we recommend and you should purchase your bidet from as we will provide you the best possible price at the time of writing this smartbidet sb-1000 review. 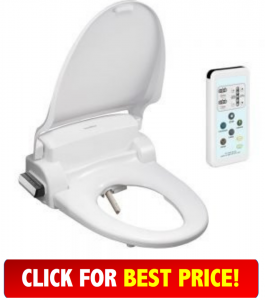 If you have landed on this page and NOT wanting to read a full review and just want to purchase this bidet toilet seat. If that is the case you can simply click on the link below which will take you straight through to Amazon.com. You will also see the reviews from customers just like you who have purchased the smartbidet sb-1000 electric bidet. If your sticking around for a full review of the SmartBidet SB-1000 Electric with remote control then read on. The smartbidet sb 1000 bidet toilet seat is well made and very high end but at mid-range pricing. I like the fact of how easy it is to install and that it comes with everything for a standard connection. The retractable nozzle that comes out when in the rinse stage self cleans itself before you use it and after it has finished. There are 5 levels of water pressure that you can set the bidet seat at. As everyone is different I think this is an awesome benefit for everyone. You can even adjust the nozzle positions for your own comfort and liking too. The single nozzle has three sets of holes: The hole on the end is for Turbo Wash, the holes in the middle are for Posterior Wash and the hole closest to the unit is for Feminine Wash.
As you would expect from a high-end bidet the smartbidet sb 1000 comes with a heated seat for those cold winter nights. Also, 5-speed adjustable air dryer for when you have finished your business and it’s time to clean up. Talking about cleanups, did I tell you this thing has 5 water, dryer pressure levels, and 3 heat levels. To be honest I really didn’t find to many faults with the Smartbidet sb-1000 bidet toilet seat. Here are a couple of things I think should be changed or fixed. The remote control didn’t come with battery either. Just my luck maybe. I might be being fussy but something else I didn’t like. The manual is very hard to read, I needed a magnifying glass just to read the instructions. Other than that, smartbidet sb 1000 is a great purchase and you’ll be really happy with it. If you are looking for a great high-end bidet at mid-range price bidet seat then we think you have found it! The reviews of the SmartBidet SB-1000 Electric Bidet Seat for Round Toilets with Remote Control are bloody good for the amount sold. With over 500+ reviews on Amazon.com alone, 90% of them are between 4 and 5 stars with an average of 4.5 out of 5 stars. Yes, there are few reviews that didn’t live up to the customer’s expectations like, some of the parts were missing or it crapped out over time. Due to the positive reviews, I don’t think you should worry about a few bad ones. You already know that no matter what it is there will always be some who’s never satisfied. For the most part, this looks like a fantastic choice. Who Is The SmartBidet SB-1000 For? If you are looking for a mid-range bidet seat with high-end features then you need to take a serious look at the SmartBidet SB-1000 Electric Bidet Seat for Round Toilets with Remote Control.